This entry was posted in 2016 Election, Alternative media, conspiracy, crime, Dept of Justice, Lying Crooked Hillary, Military, United States, Wikileaks and tagged Bill Keller, Bradley Manning, Chelsea Manning, Daniel Domscheit-Berg, DOJ press release on Julian Assange, Ecuador Interior Minister Maria Paula Romo, Ecuador President Lenin Moreno, Julian Assange, Pamela Anderson visits Julian Assange. Bookmark the permalink. Wow! I think the release of secrets during the election played a strong role in rescuing America from the Clinton crime family and the deep state. Beyond that, Assange is a mystery to me. And his association with “Chelsea” Manning is an indictment in itself. Considering the profusion of lies coming from news media and the deep state, it is impossible for me to know the truth about Assange. 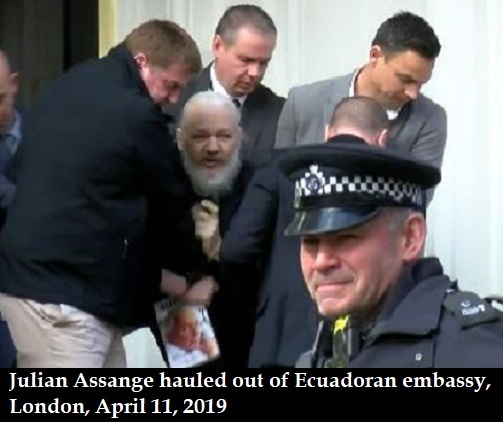 It appears Assange has gone downhill very badly physically and in personal hygiene, but that is to be expected when someone endures seven years in what amounts to solitary confinement. The signs become clear when this happens in Canadian & US prisons after 24 months. When we consider how at least three Sovereign governments are out to get him, how can anyone expect even a pretense of justice? He’s a walking dead man, for sure. Why couldn’t this happen to someone –say Broom Hilda– who really deserves it? It seems our “intelligence” agencies are lacking in intelligence. It appears they allowed nobodies among them to hack, download and disperse classified information, and yet they remained unaware? They say Assange is the guilty party, yet Manning, the thief, is now free? Something rotten here, more cover-ups. Beware, journalists, you may be next. One does not cross the ugly deep state and remain free to talk. And who bought Ecuador? How is it that the actual Hacker Bradly Manning is off perfectly free because of Obama, but the recipient of the info in now being indicted. And Trump? Whats’ up with him. I think the leeks did play a role in his election..not sure how big but there had to be an influence. Makow maintains that Assange is an Israeli asset. If so they don’t’ seem to be treating their assets very well at all. I realize that no one here would grant Pamela Anderson any level of credibility about anything. I have no idea why she is even involved in this. So I guess just disregard my previous comment. It’s probably all a big publicity stunt, “they” have something up their sleeve and they want Assange for some reason. Maybe to take the attention off of something else like our rights being whittled away and our brains and bodies being fried by 5G and WiFi. Can anyone even believe that these other “presidents” in other countries (including ours) are even freely elected anymore? That’s why they push this “voting” crap all the time because our votes really do not matter in the big elections, they own both parties, like Gary Allen said. I might suggest that Assange watch his back. As one or 2 previous commenters here stated, which I find very credible, that Assange is being brought here to help expose felon & traitor Hillary Clinton, the spirit cooking Podesta’s, and other traitors from the Obozo Admin. Rush Limbaugh seems to think AG Barr is going to do the right thing and prosecute the traitors involved in the coup attempt against our nation. I’m all for capital punishment, as these were capital offenses. John Brennen should be first to be placed in the electric chair, with a long line of Liberal/Communists & Bolsheviks to follow. The DOJ is a criminal cartel. I don’t believe Assange assisted in anything. I hope Assange remains strong and brings forward the truth concerning Seth Rich. I understand that he did a total data dump today. That should be interesting. I doubt that it contains source information, however. That is what they really want. As an example, since Seth Rich is dead he could release that without damage to him. If he doesn’t want to do that he could reiterate that the data was far too big for a “hack” and that it was given to them in another media. That would permanently squelch the stupid “Russia Collusion” meme.